You must be a member of the Vienna Classical Music Group to attend this activity. Would you like to join this group? 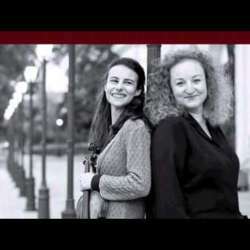 You may have already experienced their students at Prayner Conservatory--now it's the teachers' turn: Louise Chisson (violin) and Tamara Atschba (piano) will present sonatas by Brahms, Schubert, and Schumann as part of the Blüthner Zyklus concert series at the House of Engineers' beautiful ballroom.